One of only two completely free flowing rivers in the State of Maine, it is a premier early-season whitewater canoe trip. Carved away thousands of years ago by prehistoric glacial formations, the Machias River combines beautiful large stands of White Pine and bountiful, arctic-like blueberry barrens to create a river unlike any other in Maine. 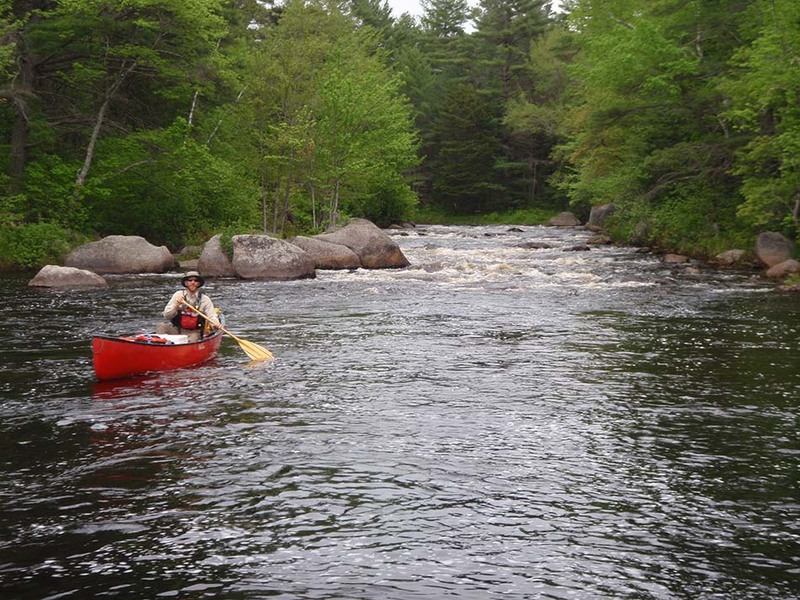 Perhaps most noted for its excellent whitewater and remote, rugged nature, the Machias River also features miles of pristine and untouched wilderness that is a hallmark of the canoe trip. Upon beginning of the main branch of the Machias river at the outlet of 1st Machias Lake, the river begins to widen and enters into a river valley that is marked by numerous Class I-II rapids mixed with tranquil flat water with the occasional Class III rapid. As the river bends and meanders around corners encroached by towering, ancient White Pine, paddlers will find themselves being transported back in time on a river that today maintains the same remote and rugged nature as it did 100s of years in the past. 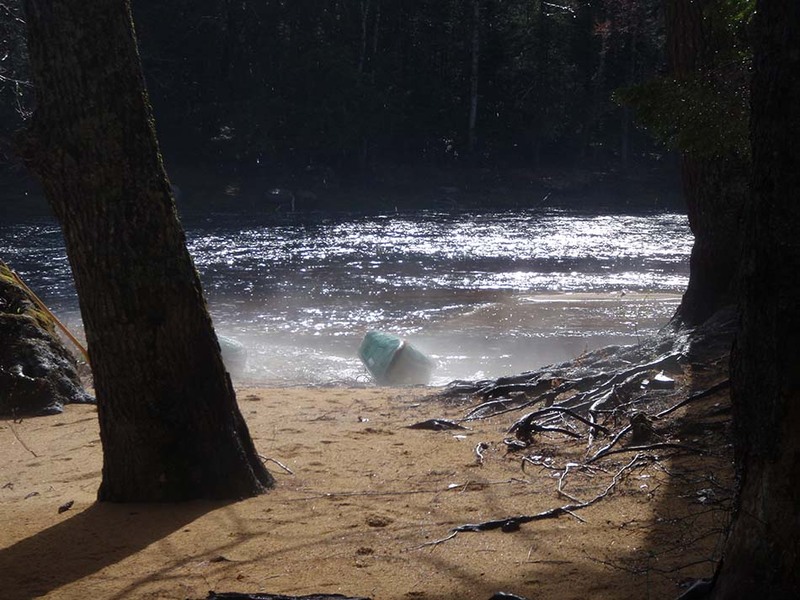 The whitewater on the Machias River ranges from pick-and-choose technical rapids to the larger and longer class III Wigwam Rapids. 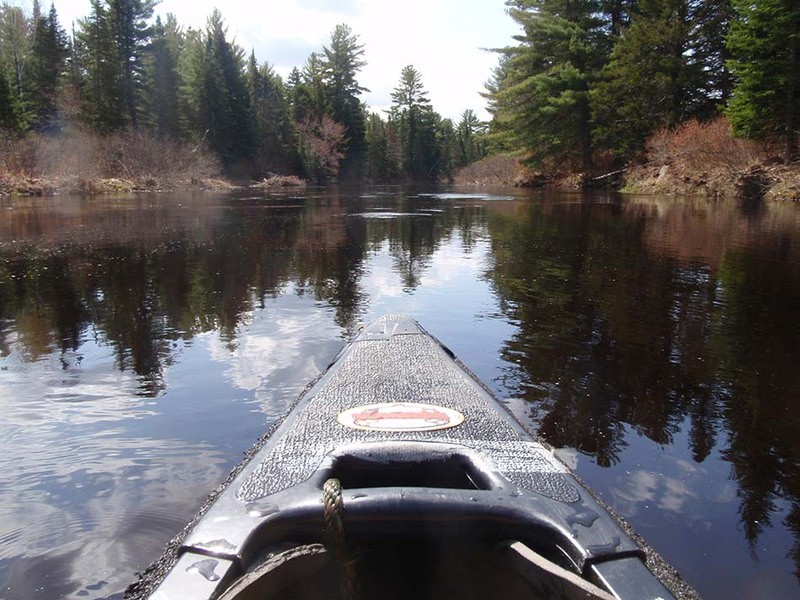 Prior paddling experience is recommended and the Machias River is often considered a must-do spring whitewater canoe trip for veteran paddlers. Our Registered Maine Guides will be with you step-by-step to help you and your party negotiates the difficult rapids and we will take our time at all of the whitewater rapids to ensure that everyone can negotiate rapids safely and with confidence of seasoned paddlers. The ability to paddle the Machias River is heavily dependent upon water levels. Spring provides the best opportunity to take advantage of these levels but trips may be arranged in the summer or fall on a ‘as we have water’ basis. A multitude of options exist in terms of trip length, dates, and options. As the Machias River canoe trip is a challenging whitewater canoe trip, prior paddling experience is recommended. Our full 7-day, and our most popular option, begins at the outlet of 5th Machias Lake and continues to Smith Landing, only 12 miles from the river end at Passamaquoddy Bay; however, other and shorter and longer trips may be arranged depending on schedule and individual preferences. Contact Smoking Rivers direct for more information on our Machias River canoe trip, one of the most excellent options for spring whitewater in the State of Maine. The Machias River, which in the Passamaquoddy language means ‘run of bad water,’ features a large variety of whitewater, ranging from Class II-III+ depending upon water level, making it an ideal choice for classic spring Maine whitewater canoe trips. 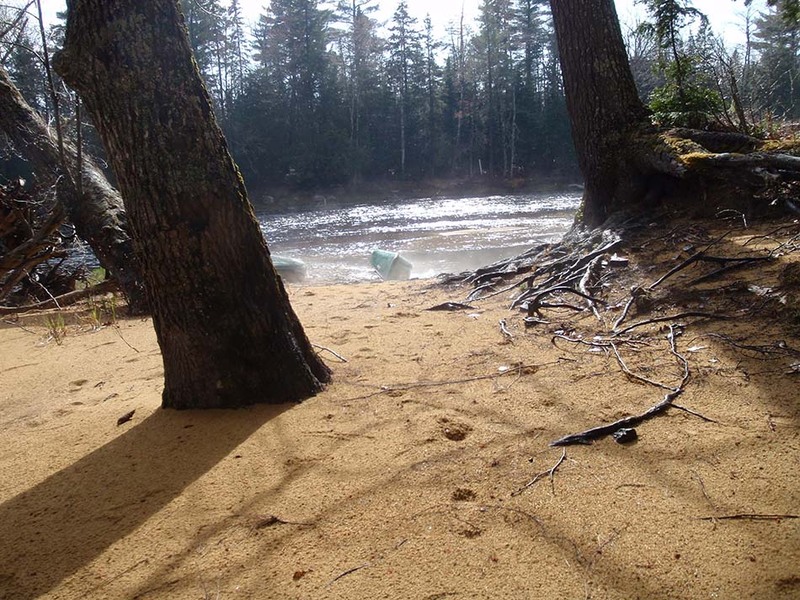 As the Machias River is completely free-flowing, the ability to schedule this trip is quite water dependent, although there exists a short window of time, generally in mid-to-late May that the river is perfect for multi-day canoe trips. Fed by a series of five pristine lakes, ringed by sand beaches and large boulders left over from the last ice age’s glacial retreat . Each Connected with their own unique tributary streams. The Lakes themselves, are unique sizes from 5th Machias Lake to 1st Machias Lake, are extremely beautiful, remote and feature stunning expansive views. 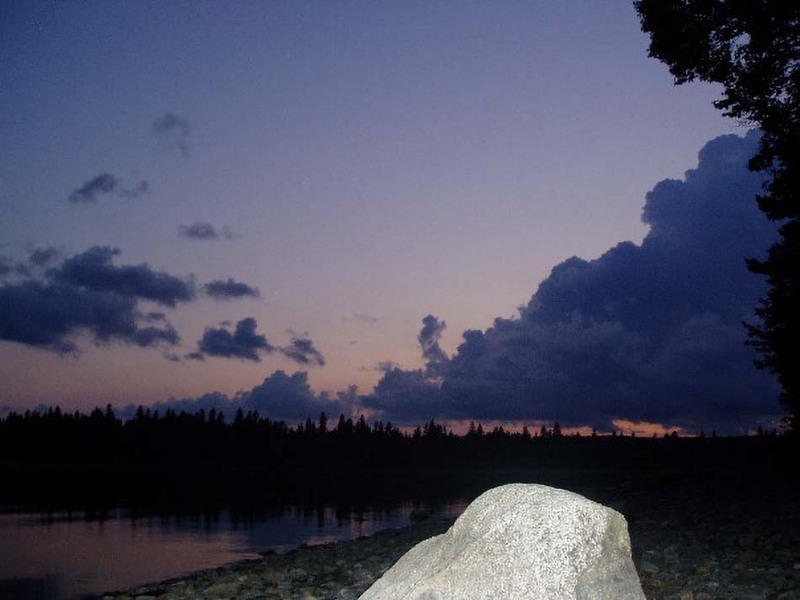 The sandy shores are make the Machias river corridor an excellent examples of ‘Downeast Maine.’ Running the gamut between turbulent and placid, Smoking Rivers offers many canoe trips that incorporate part or all of these lakes into the trip. 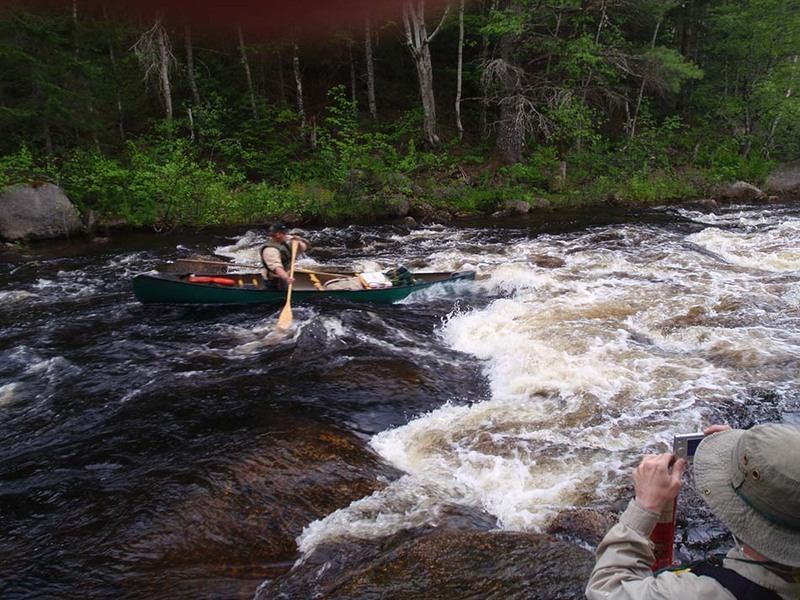 Most notably, for paddlers with experience, the run down 3rd Lake Stream, connecting 3rd Machias Lake to 2nd Machias Lake, is regarded as one of the most difficult early-season whitewater runs in a canoe. Featuring two Class III+ rapids, cascading through a relatively narrow stream, The 3rd lake stream run requires expert experience of our Registered Maine Guides to take the time to work with you group to safely negotiate rapids such as Mile Long Rips and Otter Falls. As a famed spring canoe trip in Maine, the fishing on the Machias River canoe trip is often quite superb. In the upper lakes and tributaries, fishing is primarily for Yellow & White Perch, as well as excellent Brook Trout fishing in the tributaries. Upon reaching the main branch of the river, below 1st Machias Lake, anglers are encouraged to target Maine Brook Trout, which there are in plentiful populations in the small brooks and streams entering the river, as well as beneath some of the larger sections of whitewater. As always, our Registered Maine Guides will assist in recommendations for gear, tackle, and locations to help maximize success for all anglers, whether it’s your first cast or your millionth our Maine guides local knowledge is valuable on such a remote river. The spring, in addition to being the most conducive time of year to run the Machias River due to water levels, it is also an excellent time to be on the river. 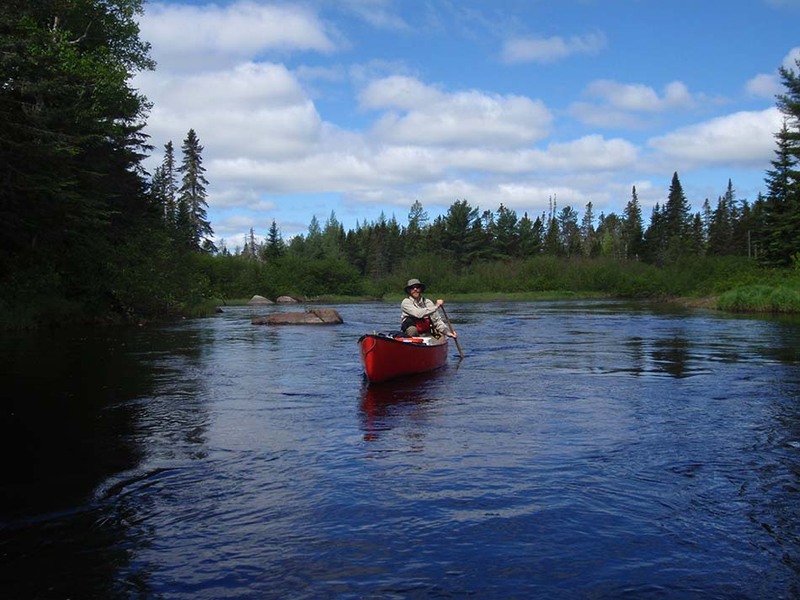 Ahead of the majority of blackflies and mosquitos, the canoe trip experiences tempters that are generally pleasant and days are quite leisurely on the river. Time is built into our schedule to provide ample time to scout the major rapids, while also leaving time for inclement weather. As we paddle into the depths of the river, we truly feel as if we are ushering in the beginning of spring in the remote woods of Eastern Maine. Like the majority of Maine rivers, the Machias River was heavily utilized in the past as a river to drive logs towards the larger towns and settlements. Draining a watershed of five large lakes, as well as countless tributaries and streams, the Machias River was an important link to the timberlands of Eastern Maine with the town of Machias, Maine. From the town of Machias, logs could easily be loaded onto ships capable of bringing the lumber to larger metropolitan areas such as Boston and New York. At its peak, in the mid-1800s, the Machias River provided nearly 40-million board feet of lumber a year to the burgeoning cities of the eastern United States. The Machias River also was an important link between the deep woods of Northern & Eastern Maine with the coastal waters of what is now Passamaquoddy Bay. Seasonally, the Passamaquoddy people used the Machias River as a major means of transportation from their hunting grounds to the more profitable fishing areas in the salt water and ruminants of their ancient society can be found along the river corridor.